Heat oven to 325°F. Place turkey, skin side up, on rack in large shallow roasting pan. Insert ovenproof meat thermometer so tip is in thickest part of breast and does not touch bone. Roast uncovered 1 hour. Mix butter, wine, thyme, salt, paprika and garlic. Brush turkey with half of the butter mixture. Roast 30 minutes; brush with remaining butter mixture. Roast about 1 hour longer or until thermometer reads 165°F. Remove turkey from oven and let stand 15 minutes for easier carving. Meanwhile, pour pan drippings into measuring cup; skim fat from drippings. Add enough water to drippings to measure 2 cups. Heat drippings to boiling in 1-quart saucepan. Mix cornstarch and 2 tablespoons cold water; stir into drippings. Boil and stir 1 minute. Serve with turkey. Invest in an instant read thermometer to ensure you cook the turkey to the proper internal temperature. Insert the thermometer in the turkey breast close to, but not touching the bone as the roasting time nears the suggested doneness time. Letting the turkey rest, tented by foil, for about 15 minutes allows the meat to finish cooking (which it will for several minutes after leaving the oven) and for the juices to be redistributed. Guaranteeing that your turkey will stay moist and juicy—and gifting you extra minutes to make gravy. The easiest way to carve a whole turkey breast is to cut each lobe of meat from the breast bone, using a long thin knife. Then you have two nice pieces that will lie flat on a cutting board that are easy to thinly slice. You can then arrange the slices on a platter for serving, with a pretty garnish of fresh herb sprigs (more fresh thyme, sage, or rosemary are classic) or small apples (cut them in half and lightly sauté them in a skillet with some butter and cinnamon) or autumn kumquats and candied cranberries. 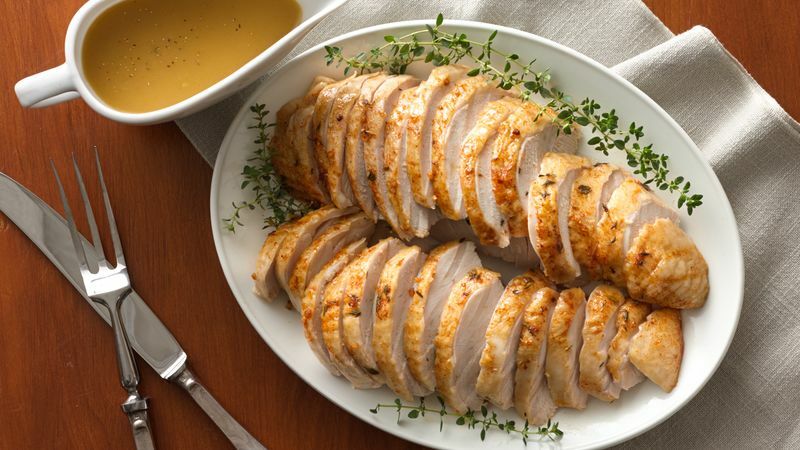 If you use wine to roast the turkey, use a style of dry white wine that you’d like to drink with the meal. Try a white Burgundy or California chardonnay. If you choose to use apple juice, make a batch of spiced cider with lots of cinnamon sticks and sliced oranges to serve while the turkey is roasting. Be sure to follow food safety rules—package up any leftovers within 2 hours. If you have any unsliced meat, go ahead and either carve it up for sandwiches or chop it up to freeze in 1 to 2 cup containers for future recipes.